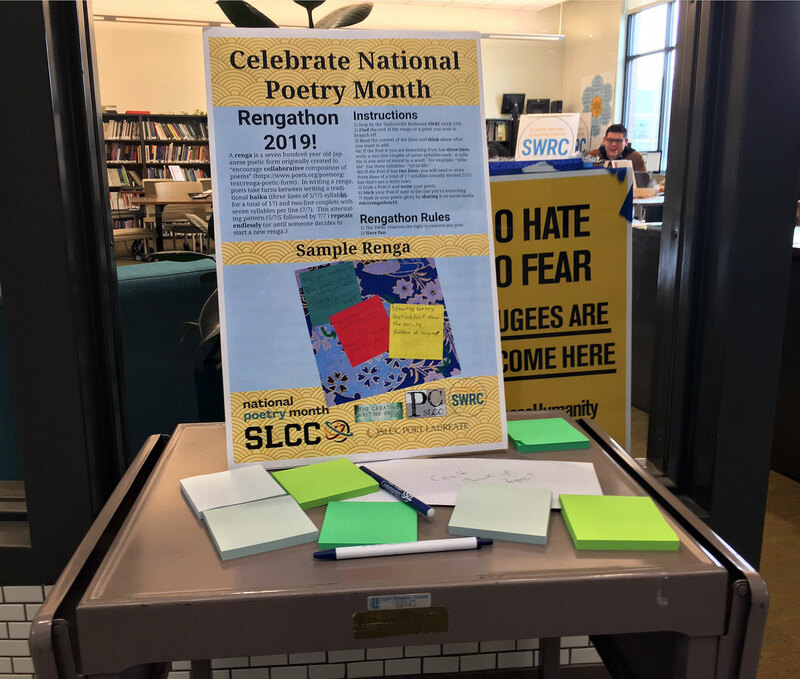 Salt Lake Community College is celebrating National Poetry Month with an interactive poetry exhibition. Rengathon is being held at the Taylorsville Redwood Campus through April 30. Renga is an ancient Japanese literary tradition translating to “collaborative poetry.” Students can participate in the exhibit by writing their own renga on a post-it note and placing it on the window of the Student Writing & Reading Center. The Academy of American Poets officially established National Poetry Month in 1996 after being inspired by the success of Black History Month and Women’s History Month. Founders hoped the celebration would call attention to the successes of American poets and promote poetry in schools, communities and the media. Now, National Poetry Month is the largest literary celebration in the world. “For me, poetry has always been somewhat intimidating and I think a lot of other people feel that same way, but you have to remember to just have with it,” says Poulter. Organizations around the country have been celebrating National Poetry Month in a variety of unique ways. Last Sunday, Cyclovia Tucson, a non-profit organization based in Tucson, Arizona, hosted a “bi-ku” — a car-free event where participants walk or ride alongside audio-equipped bicycles that read poems. In Arlington, Massachusetts, visitors can take a seat in the “Talking Chair” — a chair which features audio recordings of poems written and read by residents of Arlington and by poet Laureate Cathie Desjardins of Arlington. To keep up with the happenings this month, you can also follow the Academy of American Poets on Twitter @POETSorg.